MSc at the Comenius University, Bratislava, Slovakia (Master's Thesis was completed at the Russian Academy of Sciences and the BNHM London, Imperial College Ascot, and AMNH New York). Currently working at the PhD Thesis at the Paleontological Institute, Russian Academy of Sciences, Moscow and the Geological Institute, Slovak Academy of Sciences. ― The Systematic Association, Oxford, 1998. The most prestigeous prize for "Systematics of sensillar apparatus of the fossil Insects"
― Grants from the Royal Society, George Soros Foundation, UNESCO, AMNH, Imperial College, BNHM London, the European Science Foundation, etc. STOROZHENKO, S. & VRЉANSKЭ, P. 1995. New fossil family of the order Grylloblattida (Insecta: Plecopteroidea) from Asia. Far East Entomologist 19:1-4. VRЉANSKЭ, P. 1997. Piniblattella gen. nov. - the most ancient genus of the family Blattellidae (Blattodea) from the Lower Cretaceous of Siberia. Entomol. Probl., 28(1):67-79. MOSTOVSKI, M. & VRЉANSKЭ, P. 1998. A brief review of true flies (Diptera, Brachycera) from lower cretaceous Baissa locality. Abstracts of the First Paleoentomological Conference, Moscow: 44. MOSTOVSKI, M. & VRЉANSKЭ, P. 1998. Review of the true flies (Diptera, Brachycera) of the Lower Cretaceous of Transbaikalia. Dipterological Congress, Oxford. MOSTOVSKI, M., BLAGODEROV, V., LUKASHEVITCH, E., ZHERIKHIN, V., BUGDAEVA, E. & VRЉANSKЭ, P. 1998. The unique Baissa locality, and other Lower Cretaceous fossil sites in the west Transbaikalia. Abstracts of the First Paleoentomological Conference, Moscow. VRЉANSKЭ, P.1998. Lower Cretaceous Blattodea. Abstracts of the First Paleoentomological Conference, Moscow: 44. IHRINGOVA, P. & VRЉANSKЭ, P. 1998. Ussurijsky Zapovednik. Amba international. UNESCO WH proposals. VRЉANSKЭ, P. & WБGNER, J. 1998. Facets of fossil chironomids (Diptera, Chironomidae). Entomol. Probl. 29(2): 94. VRЉANSKЭ, P., QUICKE, D., BASIBUYUK, H., FITTON, M., ROSS, A., RASNITSYN, A. 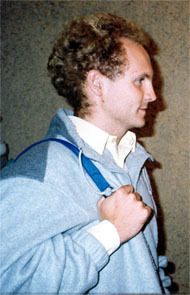 & VIDLIИKA, L. 1998. The oldest insect sensillae. Abstracts of the First Paleoentomological Conference, Moscow: 44. VRЉANSKЭ, P. 1999. Two new species of Blattaria (Insecta) from the Lower Creataceous of Asia with comments on the origin and phylogenetic position of families Polypagidae and Blattulidae (Insecta, Blattaria). Entomol. Probl. 30(2): 85-91. VRЉANSKЭ, P. 1999. Lower Cretaceous Blattaria. In: AMBA/AM/PFICM98/1.99: 167-176. VRЉANSKЭ, P., IHRINGOVA, P., BUDEEV, Y., OVDIN, E. & TRNOVSKY, M. 1999. The Nerpa. In: AMBA/B/20.99.1/ABN/C: 12 p.
ZHERIKHIN, V., MOSTOVSKI, M., VRЉANSKЭ, P., BLAGODEROV, V., LUKASHEVITCH, E. & BUGDAEVA, E. 1999. The unique Baissa locality, and other Lower Cretaceous fossil sites in the west Transbaikalia. In: AMBA/AM/PFICM98/1.99: 191-198. MOSTOVSKI, M.B. & VRЉANSKЭ, P. 2000. The unique Lower Cretaceous locality of Baissa, results and perspectives of investigation. In: Paleontology in Russia: achievements and perspectives, St. Petersburg. p. 64-65 (In Russian). VRЉANSKЭ P. 2000. Decreasing variability-from the Carboniferous to the Present! (Validated on independent lineages of Blattaria). Paleontol. J. 34 (Suppl. 3): 374-379. KHOKHRIAKOV, S. & VRЉANSKЭ, P. 2000. Ecology of Nemorhaedus caudatus (Milne-Edwards 1867) (Artiodactyla, Bovidae) in the Lazovski Reserve. In: AMBA/B/21.00.2/ABG/C: 12 p.
VRЉANSKЭ, P. & MOSTOVSKI, M.B. 2000. Vivablatta nom. nov., new replacement name for the genus Kargalia (Insecta, Blattaria). Entomol. Probl. 31(2): 194. VRЉANSKЭ, P. & ANSORGE, J. 2001. New Lower Cretaceous polyphagid cockroaches from Spain (Blattaria, Polyphagidae, Vitisminae subfam. nov.). Cretaceous Research 22: 157-162. VRЉANSKЭ, P., QUICKE, D.L.J., RASNITSYN, A.P., BASIBUYUK, H., ROSS, A., FITTON, M., & VIDLIИKA, ј. 2001. The oldest fossil insect sensilla. In: AMBA/B/21.01.3/ABS/D: 8 pp. VRЉANSKЭ, P., VISHNIAKOVA, V.N. & RASNITSYN, A.P. 2002. Order Blattida Latreille, 1810. In: Rasnitsyn, A.P., Quicke, D.L.J. (eds.). History of Insects. Dodrecht etc., Kluwer Academic Publishers: 263-270. VRЉANSKЭ, P., MOSTOVSKI, M.B., BAZYLEV, B.A & BUGDAEVA, E. 2002. Early Cretaceous Climate Changes Suggested on the Basis of Cockroach Wing Variations. Proceedinings of the XVII. Congress of Carpathian-Balkan Geological Association Bratislava, Sept 1st-4th 2002 (CD). Geologica Carpathica 33 (special issue): 5 pp. VRЉANSKЭ, P. 2002. Origin and the Early Evolution of Mantises. AMBA projekty 6(1): 1-16. VRЉANSKЭ, P. 2002. Jantarimantis nom. nov. and Jantarimantidae nom. nov., new replacement names for the genus Archimantis Vrљanskэ, 2002, and the family Archinmantidae Vrљanskэ, 2002 (Insecta, Mantodea). AMBA projekty 6(2): 1. VIDLIИKA, J., VRЉANSKЭ, P. & SHCHERBAKOV, D.E. 2003. Two new troglobitic species of the genus Spelaeoblatta (Blattaria: Nocticollidae) from North Thailand. Journal of Natural History 37: 107-114. ANISYUTKIN, L.N., GRACHEV, V.G., PONOMARENKO, A.G., RASNITSYN, A.P., and VRЉANSKЭ, P. 2008. Part II. Fossil Insects in the Cretaceous Mangrove Facies of Southern Negev, Israel. In: Krassilov V. and Rasnitsyn A., eds, Plantarthropod interactions in the early angiosperm history. Evidence from the Cretaceous of Israel. Sofia-Moscow & Leiden-Boston: Pensoft Publishers & BRILL, pp. 189-223. VRЉANSKЭ, P. & ANSORGE, J. in press. Lower Toarcian Blattaria (Insecta) of Germany and England. Greifswalder Geowissenschaftliche Beitrдge.